Dads get so used to the typical card and pair of socks that it actually comes as a surprise when the kids go out of their way to show their appreciation. Use some of these ideas for Fathers Day celebrations to let your dad know just how much he means to you. The family lunch is a simple way to show your appreciation, but it's something dads definitely enjoy. Fathers Day is about family, and as families get older they tend to see less and less of each other. That's why it's great to have regular occasions throughout the year where the extended family gets together for a banquet. Make sure plenty of Dad's favorite foods are on the table. If you have multiple generations of Dads in your family, having them break bread at the same table makes for an extra special treat. Look for some great Fathers Day Brunch Recipes here. Dads are usually the hardest people to buy for. What do you give somebody who either already has everything or has the money to go out and buy whatever they want? One of the most meaningful ideas for Fathers Day gifts is to make one with your own hands. This could be something like knitted clothing or a useful item built out of wood. If you have your own kids, encourage them to make handmade cards for Grandpa with glitter, glue and colored paper. My friend Marcia has a great website about operating a daycare for children. Here you will find some Fathers Day craft ideas and other holiday projects her students have made. Have a Fathers Day Party, Starring...Dad! Turning Fathers Day into a theme party is one of our favorite ideas for Fathers day. And what better theme to use than "Dad" himself? There are two ways you can approach this. You can either choose your own Dad to be the theme by having the whole family dress up in his style of clothing, or various different styles he has worn at different times in his life. Or you can just dress up as any famous Dad from popular culture  think Homer Simpson, Fred Flintstone and so on. Of course, a big part of getting a party right is making sure you have good decorations. 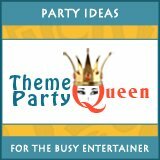 If you're having a theme party, try to match the decorations to the theme as much as possible. For instance, if you want to have a "retro" themed Fathers Day party to celebrate Dad's glory years, see if you can find a lava lamp or some shag-pile carpet to place on the floor. Photos also make great decorations. Find some of your favorite photos of you and your Dad together and get them framed, then position them in various places around your house (don't forget the bathroom). As you are thinking about ideas for Fathers Day celebrations, remember that the party is about Dad  so if there's something he's particularly obsessed with, find a way to work it into the decorations, food or theme.